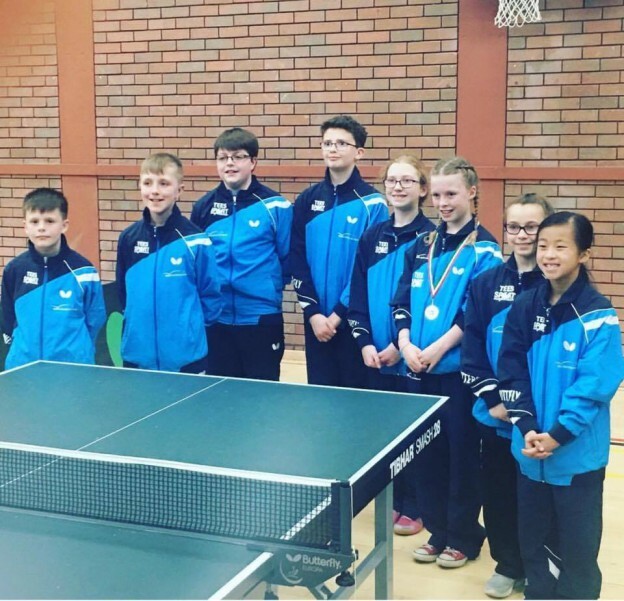 Chad Duncan, Jamie Johnson, Patric Hollywood & Jess Hogg recently represented Scotland at The British Primary Schools Championships in Cardiff, which saw half of the eight players selected to represent Scotland from North Ayrshire TTC. Chad, Patric & Jamie teamed up with Aberdeen’s Dylan Thies in the team event where the boys finished in 4th place beating Isle of Man & Guernesey and just missing out on a bronze medal after a marathon match against the home team Wales, where Scotland narrowly lost out 6-4. West Kilbride’s Jess Hogg put in her best performance to date to win Bronze medal in the Girls Team Event alongside team mates Willow Shek (Aberdeen), Glasgow’s Amelia Smolarek (Glasgow) & Shannon Brown (Dumfries). The girls beat Guernsey 10-0, Isle of Man 10-0 and drew with Wales 5-5 to win the Bronze Medal on countback. Jess also picked up a Bronze medal in the Girls Plate event showing that her months of hard work prior to this event paying dividends. A fantastic experience for Chad, Patric, Jamie & Jess in which they all performed brilliantly under pressure and showed they can compete and win on the international stage against some of the best players in the UK. This entry was posted in Latest News on 11th April 2017 by Chris Main.